Ron Galimam and Cynthia Ong for reviewing prior to publication. Emerging from the mist that covers the island of Borneo, the otherworldly appearance of multi-peaked Mount Kinabalu mirrors the reverence the indigenous Kadazan have for it. They call the mountain akina-balu, resting place of the ancestral spirits, and it plays a key role in their creation stories and legends, which inform traditional land relationships and conservation practices. Kinabalu is also home to a spectrum of exotic plants and endangered animal species. From 1975 to 1999, copper mining on the mountainside damaged the landscape, contaminated the water supply, and left behind millions of tons of tailings that continue to pose an environmental threat. Meanwhile, the area has become increasingly exposed to eco-social pressures stemming from logging, oil-palm plantations, settlements and tourism, while the Kadazan are experiencing threats to the durability of their traditions. Although the national park surrounding Kinabalu is a UNESCO World Heritage site and is protected from development, poverty in nearby villages encourages the pursuit of damaging industries. The Kadazan, NGOs and the Sabah government, however, are taking steps to respond to these threats and preserve the cultural and ecolological treasures of Mount Kinabalu. 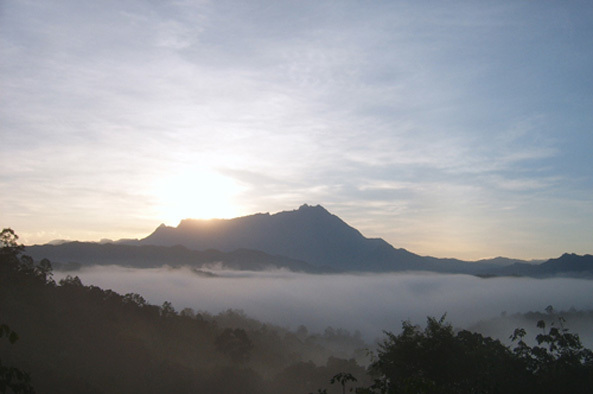 Because of its serene climate, between the monsoon and typhoon belts of Asia, Sabah — the Malaysian state that is home to Kinabalu —is known as the “Land Beneath the Wind.” Its mountain slopes are covered by cloud forests, which, because of their moisture, contain a higher level of biodiversity than other types of forest. They also provide plentiful water for human settlements by capturing the clouds’ moisture and channeling it into rivers that have their headwaters in the mountains. Topping out at 13,435 feet, Mount Kinabalu is the fifth highest mountain in Southeast Asia and is part of one of the largest remaining rainforests in the world. Mount Kinabalu’s peaks occupy an environmental and spiritual center for the Kadazan people, also known as Dusun by some anthropologists. They are the majority population in northern Borneo and have many distinct clan groups with their own cultural practices, but they share a common agricultural lifestyle based on rotating fields in 20-year cycles and preserving large areas of rainforest. The Kadazan venerate the rainforest and Mount Kinabalu in their creation story, which tells of a rivalry between the male god Kinoingan, who created the sky and clouds, and his wife, Suminundu, who created the land. When Kinoingan saw that the clouds were smaller than the land, he felt ashamed. But Suminundu took pity on him and remade the vast land into the island Borneo, with its center at Kinabalu. Another legend describes the intimate connection between the people and the foods of the land that sustain them: After a prolonged drought, Kinoingan sacrificed their daughter Huminodun, scattering the pieces of her body across the land. Then the rains came, and her flesh gave rise to rice, her bones to tapioca, her head to coconut, her fingers to ginger, her teeth to corn, her knees to yams, and many other edible plants. Today, the people still honor this sacrifice at annual harvest festivals. The beliefs of the Kadazan are intertwined with their natural environment, which is infused with spirits, both good and evil. Each person has a spirit while alive, koduduwo, and after death, tombiruvo. Mount Kinabalu is traditionally regarded as a resting place for spirits after they have died and are on their way to their final destination in a world beyond our own, making the mountain a link between the physical and spiritual world. Mount Kinabalu is home to medicinal plants and sacred roots through which the bobohizan, female priestesses, channel their “familiar spirit,” the particular spirit that guides each priestess’ ritual practice. The bobohizan have traditionally led prayers and ceremonies during the rice harvest, the most important season for the Kadazan, and invoke the good spirits to bring fortune — and rice — to the community throughout the year. They also act as medicine women, consulting the spirits and using prayers to diagnose and treat illness. The British colonial officer Sir Hugh Low is the first documented individual to reach Mount Kinabalu’s summit, in 1851, and its highest peak is named after him. However, it is highly likely that the Kadazan had already climbed the mountain, considering that they train their children to begin trekking by three years of age. The Malaysian state government created Kinabalu Park in 1964, and in 2000 the park was designated a UNESCO World Heritage site, one of three in Malaysia, because of its high levels of biodiversity and endemism. Within the cloud forest surrounding the mountain, a paradise of flora includes the carnivorous nepenthe pitcher plant, hundreds of fern and orchid species, and the flowering Rafflesia, which produces blooms more than three feet in diameter and 20 pounds in weight — the world’s largest. Nearly 500 birds and mammal species, including the endangered orangutan, have also been documented within the park’s boundaries. In the past few decades, the Kadazan way of life has changed dramatically. Sabah’s 1963 entrance into the Malaysian Federation brought many ethnic Malays to Sabah for business and tourism. Also, because many Kadazan have converted to evangelical Christianity, introduced by missionaries in the 1970s, fewer indigenous priests and priestesses are alive to train protégés. This loss threatens the durability of Kadazan traditions, beliefs in the sacredness of the landscape, and regulations for land use. A 1930 law under the Sabah Land Ordinance affirms native customary rights (individual and communal land titles to traditional lands); however, many communities never defined their traditional lands nor applied for title because of the opacity of the process. Increased road construction has made the Mount Kinabalu area more accessible to tourists, loggers and settlers, exposing it to several eco-social pressures. Island-wide, one third of Borneo’s forests have been logged, and Mount Kinabalu has not been immune to illegal logging. Poverty drives some indigenous people to log under the auspices of native customary rights but then sell the timber to corporations. The soil left behind after deforestation is poor in nutrients and vulnerable to erosion. The precious cloud forests are threatened by climate change, new agricultural practices, and, in the case of Mount Kinabalu, tourism development. In 1975, the first open-cast mine in Malaysia opened on the southeastern side of Mount Kinabalu. The Mamut copper mine operated until 1999, and from the very beginning Mamut caused significant damage to the land around the mountain. Silt and acid drainage entered the water supply, affecting aquatic life, agricultural production and human drinking water. Mamut generated 150 million tons of tailings — byproducts from the metal ore extraction process — which were mixed with water and slurried to a nearby dam. The tailing pipe’s first leak was in 1975, when it contaminated nearby rice fields. Another leak polluted the Lohan River, and the Bambangan River currently shows high levels of acidity. The acidic liquid waste in the abandoned mine pit itself has hardened into 1,000 acres of barren land. Because mining regulations were not passed in Sabah until 1999, just as Mamut closed, the company cannot be held responsible for cleanup, so the government has been saddled with the costs. While it continues to shore up the walls of the tailings dam, which are in continual danger of crumbling, the nearby rivers remain polluted. Mamut’s owner, Mega First Corp. Berhad, has indicated an interest in additional mining in the region. Sabah Tourism, Culture and Environment Minister Datuk Masidi Manjun has said publicly that the Mamut site must be cleaned up first, and that Sabah should look beyond mining for other sorts of development projects. However, a high copper price may prove too tempting. Another threat is the growth of oil palm plantations, which are using enormous amounts of land, causing deforestation and water pollution from soil erosion. Plantations currently surround the park on the north, east and southern sides, and are operated by both state-owned and foreign companies. In the face of rapid population growth among nonindigenous people in northern Borneo, the Kadazan and other indigenous people are struggling to retain their traditional systems for managing the ecosystem. Toward that end, obtaining government-recognized land titles is important. Partners of Community Organizations Trust conducts mapping projects in Sabah in order to officially demarcate Kadazan traditional territory and resources. Park staff created the Kinabalu Ethnobotanical Project in 1992 to gather information from the Kadazan people on the hundreds of plants they use for food, building construction, medicine and weaving. Thanks to a highway completed in 1982, Kinabalu Park is only two and a half hours by bus from Kota Kinabalu, one of the fastest-growing cities in Malaysia, making the mountain a top tourist destination in Southeast Asia. The number of climbers grows every year — increasing from 40,390 in 2007 to 48,604 in 2008 — and hundreds of thousands of others travel in and around the park. The Sabah government is actively encouraging tourism by bringing more international flights to Kota Kinabalu, emphasizing the mountain in promotional material, and trying to keep airfare and climbing costs down. The culture of Sabah’s indigenous people is also a major component of tourism — visitors want to see traditional longhouses and cultural performances. Local Kadazan often act as park guides and rangers, a tradition that started with Gunting bin Lagadan, a man from Bundu Tahan village who was the first park ranger. Their reverence for the mountain means that the park is immaculately free of litter and no logging is allowed within the park reserve. Many make their living as porters carrying climbers’ bags up and down the mountain, or bringing food to mountain chalets. In years past when a group reached the summit, the Kadazan would sacrifice a chicken to apologize to the spirits for disturbing them. Now, because of the large numbers of climbers, indigenous rangers and priests perform an annual ritual, which includes a sacrifice of seven chickens, offerings of local fruit and other delicacies to the spirits, and the recitation of the names of prominent ancestors. Because its environmental and cultural diversity are a chief asset, the government of Sabah has a financial incentive to support Kadazan traditions of caring for the land. The tourism industry, too, realizes that its future depends on taking care of Mount Kinabalu. The rapid growth of tourism means that it must be carefully regulated to prevent the overuse of resources; building facilities for tourists, like a new golf course near the mountain, threatens the cloud forests and conventional forests alike. The region around the mountain is still threatened by the economic pressures of poverty and immigrants who do not traditionally revere the landscape, but sustainable agriculture projects may provide a solution. One proposed project is the cultivation of agarwood, or gaharu — a valuable resin used in incense and perfume that is found in old-growth native Aquilaria trees. Increased and indiscriminate harvesting throughout Southeast Asia has endangered the trees, but a new method allows the extraction of resin in young, plantation-grown trees, without requiring that they be cut down, thus providing a renewable, nontimber forest product. Such an industry could reduce the incentive for logging, both legal and illegal. LEAP (Land Empowerment Animals People) focuses its community-based conservation work on Sabah and has a variety of projects in land preservation, sustainable land use, ecotourism and species protection. Visit their website to learn more about their programs and how you can support their work. Ahmad, Sagar. “Mount Kinabalu, more than a walk uphill.” New Straits Times (Malaysia), August 15, 2001. “Battle of Mount Kinabalu Begins.” New Straits Times (Malaysia), August 22, 2008. Blanchette, Robert A. “Sustainable Agarwood Production in Aquilaria Trees.” University of Minnesota Forest Pathology and Wood Microbiology Research Lab. Chan, Julia. “Mysteries in the Mists of Kinabalu.” New Straits Times (Malaysia), July 23, 2006. Chiew, Hilary. “Poisonous wasteland.” The Star Online, October 2, 2007. Jambul, Awang. “The Reality in Sabah is Different.” New Straits Times (Malaysia), October 6, 2005. John, Elizabeth, et al. “Concern over Increasing Threat of Destruction to Cloud Forests.” New Straits Times (Malaysia), February 10, 2004. Jopony, Marcus and Murtedza Mohamed. “Copper Mining in Malaysia—Environmental Pollution and Its Control.” In The Impact of Mining on the Environment: Problems and Solutions (Proceedings of the International Symposium January 11-16, 1994, Nagpur, India), 443-452. Rotterdam: A.A. Balkema, 1994. Kaur, Jaswinder. “Tourism wind picks up in Sabah.” New Straits Times (Malaysia), December 30, 2006. Madi, Emin. “Conqueror of Mount Kinabalu.” New Straits Times (Malaysia), June 24, 2004. Madi, Emin. “Lunsin Keeps Mt Kinabalu’s Guardians Happy.” New Straits Times (Malaysia), October 26, 2004. Orkin, David and Laura Thorpe. “Borneo: The Complete Guide to Borneo.” The Independent (London), January 17, 2004. PACOS Trust. “Indigenous Peoples of Sabah.” PACOS Trust (Partners of Community Organizations). PACOS Trust. “Programmes.” PACOS Trust (Partners of Community Organizations). Phang, Pamela. “Sabah’s House of Skulls.” AllMalaysia.info, March 13, 2004. Salick, Jan, et al. “Whence useful plants? A direct relationship between biodiversity and useful plants among the Dusun of Mt. Kinabalu.” Biodiversity and Conservation 8 (1999): 797-818. Star Publications. “Mt Kinabalu Lures Rising Number of Climbers.” The Star Online, February 18, 2009. Star Publications. “Troubled Village.” The Star Online, October 2, 2007. United Nations Educational Scientific and Cultural Organization. “Kinabalu Park.” UNESCO World Heritage Centre. Williams, Thomas Rhys. The Dusun: A North Borneo Society. New York: Holt, Rinehart and Winston, 1965. WWF. “Heart of Borneo Forests.” WWF International.